Baltimore Orioles usually winter in South and Central America, and historically it was unusual to see one in South Carolina during the winter. However, during the last few decades, they have been wintering along the East Coast and Southeast in greater abundance. Last year’s Great Backyard Bird Count results had sightings ranging along the east coast from Massachusetts to Florida, with the bulk of the birds wintering from Virginia, south to Florida, There were a scattering of reports from the Gulf States and as far west as California. 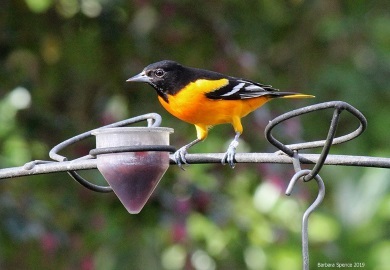 South Carolina Winter Baltimore Oriole Survey data combined with the Great Backyard Bird Count data had South Carolina with the largest numbers of orioles in 2018. South Carolina had 64 reports (28 percent of the total number of reports in the country) and 228 orioles tallied, (28 percent of the total number of orioles reported). South Carolina had orioles as far inland as Lexington County and along the coastal plain from Myrtle Beach to Hilton Head Island.